A Salmon for Simon ~ Booking Across Canada ~ B.C. 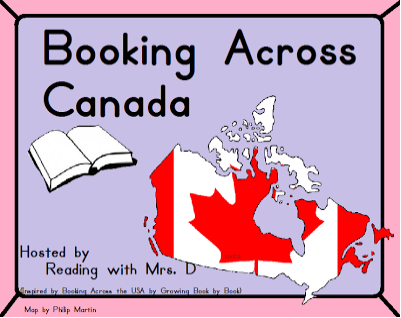 I'm participating in a reading event hosted by Reading With Mrs. D, a Canadian blogger from Nova Scotia. 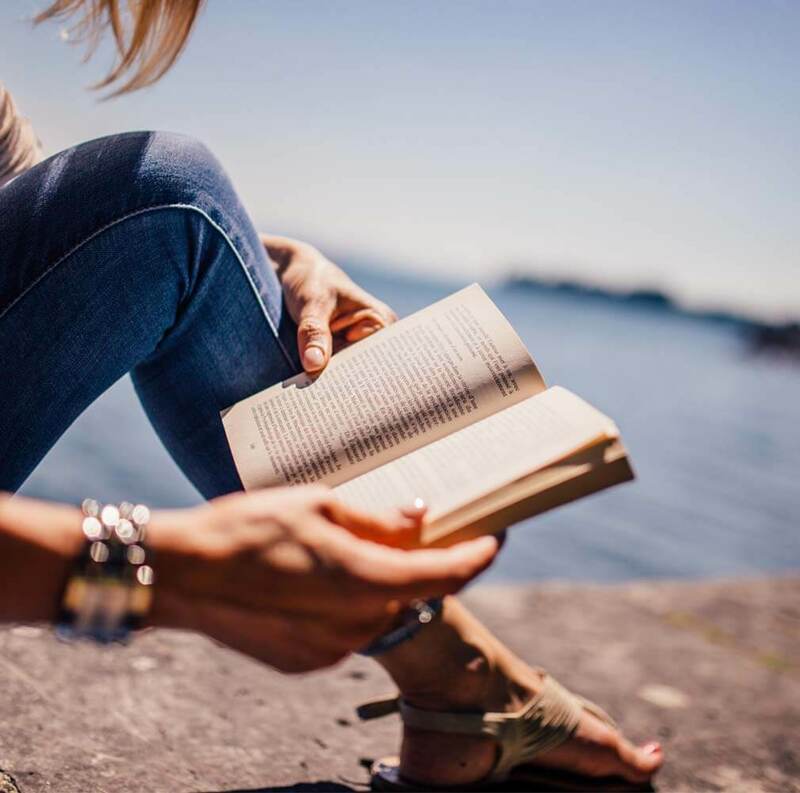 All sorts of Canadian bloggers are linking up to share a Canadian-authored book, representative of their province or territory. My choice is A Salmon for Simon. This beautiful book was written over 30 years ago ~ the same year I was married ~ 1978. It's won two awards and has easily withstood the test of time. Opening Lines: All summer Simon had been fishing for a salmon. "It's the king of the fishes," he told his sisters. "We know," they said. "That's why great-grandmother calls it Sukai." When Simon was little, his sisters had taught him how to catch minnows with a strainer. But this year his father had given him a fishing pole of his own, and he had been fishing every day. He hadn't caught a single salmon. 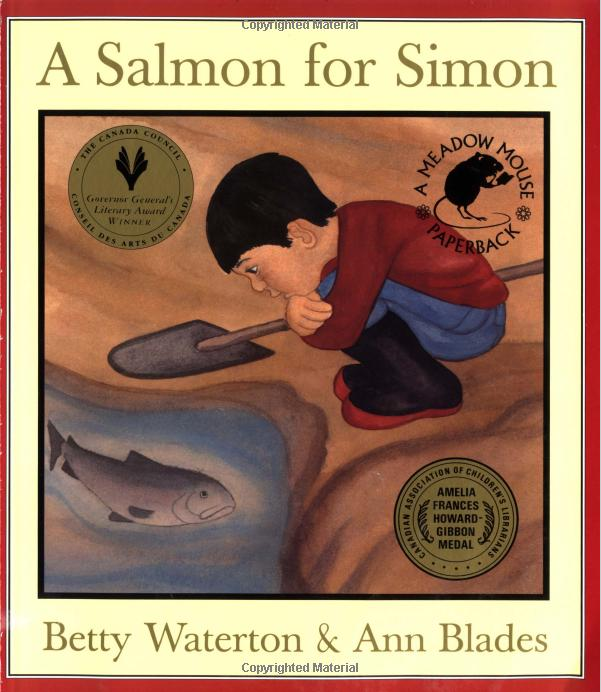 Brief Synopsis: Simon spends his summer desperately hoping to catch a salmon. But September arrives and still no luck. One day a bald eagle, flying by with a coho in its talons, miraculously drops it in a clam hole right in front of Simon. Simon is so struck with the beauty of the salmon, that he makes an unexpected decision. Why I Like This Book: It's pure West Coast, the children are First Nations, the illustrations are realistic, and the overall theme is book-discussion worthy. I think this book has always been a winner and I'm very happy it's still in print. 1. Click this image for some great extension activities, complete with some printables. 2. Predictions: Stop reading the book at the point where Simon makes his decision about the salmon, and have the children draw pictures predicting what they think Simon will do. 4. Fisheries and Oceans Canada has a fabulous unit called "Salmonids in the Classroom". It's a little advanced for primary, but it would be easy enough to adjust. The unit is very detailed, has lots of handouts and is tied in to our BC curriculum. 5. 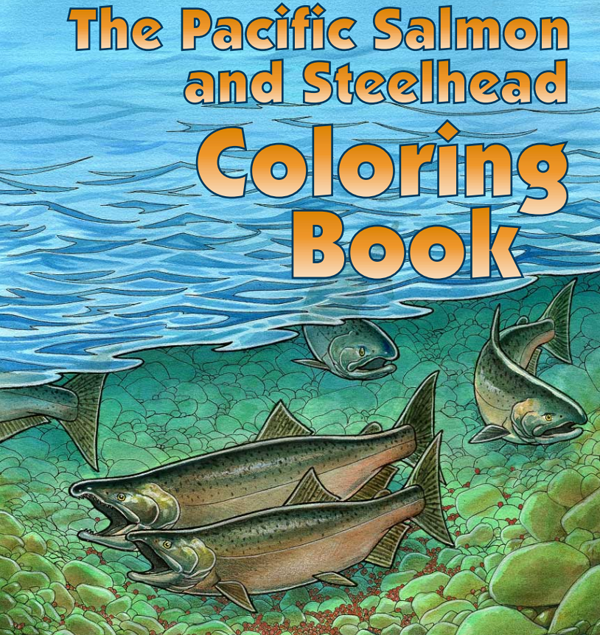 Here's a fabulous educational colouring book from the US Fish and Wildlife Service. 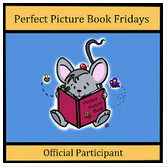 I'm also linking up with Susanna Hill's weekly Perfect Picture Book Friday! I LOVE that linky. I love this book. I use it every year with a guided reading group - you are right, it is a book with a lot of possibilities. Thanks for all the links!! I've never seen salmon in their natural habitat, so I really enjoyed reading your comments and watching the video. (Salmon is my chocolate.) Great book and subjects for your students. I love your activities. Have also become familiar with First Nation books and plan to get a few. I just bought a fabulous new First Nations book that I'm going to share in the next week or two. Thanks for stopping by, Patricia. Wow! Such a thorough post. Thanks for giving us a great book to share and many excellent resources. This looks like a beautiful, timeless book. 'Can't wait to add it to my list. Thanks for stopping by, Joanne! What a great choice and post, Barb, I need to add this one to my first nation picture books shelf! I love this book......I also did the Deep Space Sparkle art lesson along with our study. You have inspired me to dig it out again. I teach in Ontario, love the Canadian content. Deep Space Sparkle always has the greatest art lessons! I've seen salmon of the Great Lakes, but these guys are even more awesome! I have many fisherman in my group, so this book is in my cart. I'm excited to find out more about First Nation...I love to learn! Whoops...fishermen! Why do I always proofread after I hit publish?! I didn't even know there were salmon in the Great Lakes! Cool! The book looks adorable and the fish art would be fun to go along with it. I like to use little videos to go along with our units too! Now that we have smart boards, video clips are the best. What a great review! I love the video clip. The grade 1 teacher at our school does a salmonid unit with her kids. Goldstream was a family stomp when I was growing up in Victoria. I haven't been there in years. You are lucky to be able to take your classes there. I just uploaded my review on S is for Spirit Bear. "Imagine a fish that comes with its own lunchbag" - too funny! The cover of the book looks great - I admit, I judge! Haha! Thanks for stopping by. Thanks Barb for stopping by. I have just added to link to my TpT store if you want to download the preview and see what the other worksheets look like for S is for Spirit Bear. I think your kids will love it. I put it as Grade 2-5, but I am sure that Grade 1 can do it this late in the year. Have fun with studying Canada. This book is great and so are your ideas! You are always so creative...must be all that running you do! I think there has to be link somewhere there...today alone I have read 3 blogs from teachers who RUN and blog. Now, if I could only get the running part going! Thanks for sharing this. Sometimes we focus so much on cultures far away that we forgot that we have unique and special traditions close by. I love the artwork! I plan to find this book for next year. I can't wait to use the video link. This book sounds terrific, Barbara! It sounds like the central conflict is a tough one, since Simon tries so hard for something that matters to him, but at the moment of truth has to make a decision... I have a guess as to what it might be :) Love your activities!!! Thanks so much for sharing this one!